Traditional network management systems haven’t adapted to the scale demanded by virtualization and cloud architectures. Distributed system designs may show the way. CloudStack, the open source software platform for private clouds, has been elevated to a top-level project in the Apache open source community, further validating the project's viability. APIs are helping to usher in new mechanisms for making data center management more automated and scalable. They’re also key to network virtualization and private clouds. Highly virtualized data centers are exposing cracks in traditional network constructs such as VLANs. New approaches that abstract the physical network, including network overlays, are key to providing flexibility and scale. Just because you slip a hypervisor under an application doesn't make it equally suited to private and public clouds. Know the differences to get the most from your application deployments. Traditional networking is static; clouds need systems that can scale. What's the answer for a private cloud: APIs? SDN? OpenFlow? VXLAN? Take a look. VMware and EMC are pushing their concepts for the "software-defined data center." But what does it mean? How's it different from cloud computing? We take a look. The Frankenstein method of disparate systems in the data center can impede expansion and the march toward the private cloud. Pod architecture design can offer better standardization and tighter integration. Learn more about the method. Taking a staged approach to building a private cloud helps ensure success along the way. Here's how to break it down. Private-cloud computing is not just about technology, but about how IT delivers services. To be successful, the roles that staffers play are changing, as well. Here's how to adapt. Multiple hypervisors in the data center may seem like a good idea: You get leverage during negotiations, and potentially avoid vendor lock-in. But dig deeper and the arguments begin to fall apart. IT chargeback/trackback systems can help IT justify and prioritize new projects and purchases. They can also help ease private cloud deployments, according to our contributor. Your IT staff is likely full of technologists, which won't help you find success with a private-cloud deployment. Here's why shifting to an IT service catalog approach may ease your transition to the cloud. Are you designing a private cloud infrastructure? Best practices are a crutch--start with current recommended practices, ask yourself why, and more tips for building a private cloud. 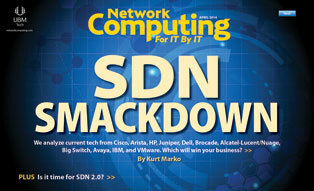 Everyone's talking about SDN. Find out why and how software-defined networking could help organizations. What are the differences between OpenStack and CloudStack? Here are some things to know. Google Docs, Dropbox, Carbonite and other cloud computing services may be hosting your corporate data right now. Learn why you need to accept the cloud and regain control. The marketing is there, and has been for some time. Buzzwords have been coined and your interest is piqued. You sat back long enough to see if this was just vaporware or real, while gaseous. Cloud turns out to be more solid than its nomenclature. You’re ready, in fact you’re all in. Now the bad news: If you want to succeed in the cloud, the long-term relationship you've had with your apps must be broken up. Here are eight steps for going from zero to private cloud. Note that I didn’t say eight "easy" steps. But don’t let that bother you--nothing that’s easy is ever worth doing anyway. Right this minute your data center(s) are broken. You, monitoring systems or NOC may or may not know it. All of the blinky lights may be green, all systems reporting normal, but the data center is broken, and it’s costing you money and business agility.